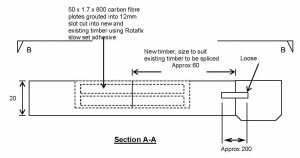 This case study outlines the products and methods used to repair a floor/ceiling joist using carbon fibre and Rotafix Structural Adhesive(RSA). 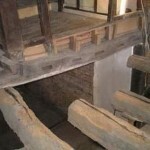 Rotafix were requested to develop a repair methodology for a jettied property dating to c1600 in St Albans, Hertfordshire. 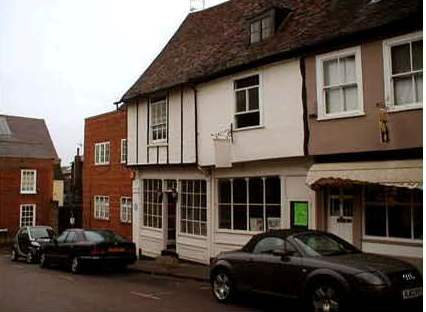 The buildings in this street are believed to be part of the Antelope/Tabard Inn, depicted in a painting by Buckler of 1824. 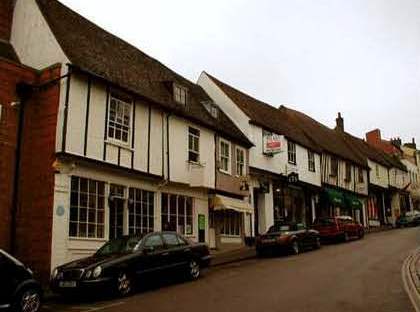 The findings generally align to an earlier interpretation of the building as a front range of the late 14th-early 15th century with a crown-post roof and a 17th century rear range with a gallery. 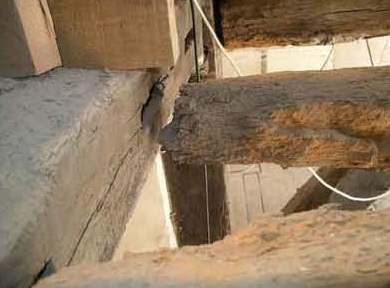 The rear range appears to be early 17th century, although it may have been altered in the mid-17th century when the link piece was added. 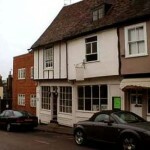 Number 19 George Street was also assessed as part of the report and appears to date to the late 16th-early 17th century. The buildings as a whole have been extensively reworked throughout the centuries and comprise three different construction phases with many later phases of alteration, including the addition of cellars. 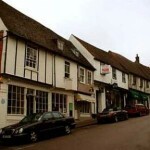 From at least the Victorian period, the buildings have been divided into numbers 18 and 19 and used as a public house and shop, and more recently as shops. 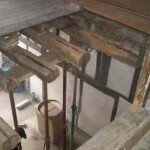 Rotafix were asked to develop a solution to reconnect the floor/ceiling joists between the ground and second floors that had decayed and were now unsupported. 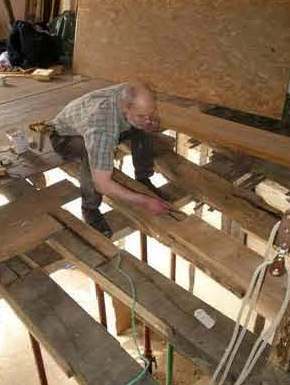 Given the historic significance of the period property every effort was made to ensure that the existing timbers were preserved where possible. 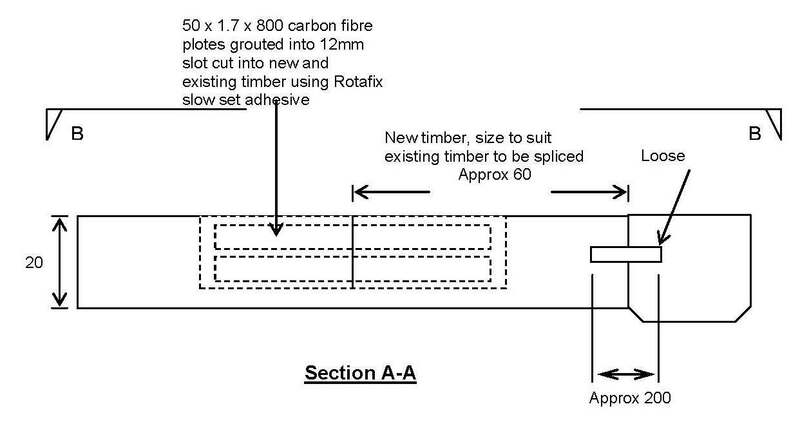 Rotafix developed a repair methodology using their Resiwood range of products that consisted of cutting narrow slots into the existing timber then butting up new species matched timber and connecting both parts together with Rotafix Structural Adhesive (RSA) and Carbon Fibre Reinforced Plate(CFRP). 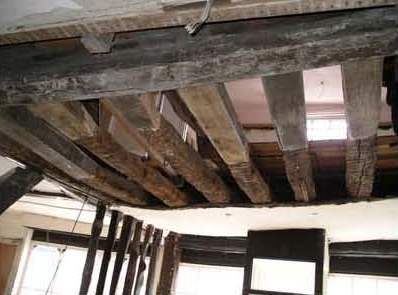 The use of CFRP allowed Rotafix to achieve the structural strength required for the floor loading but also satisfied the requirements of English Heritage that any repair must ensure that the minimum amount of materials should be removed from the historic timbers. The schematic of the repair is shown below. 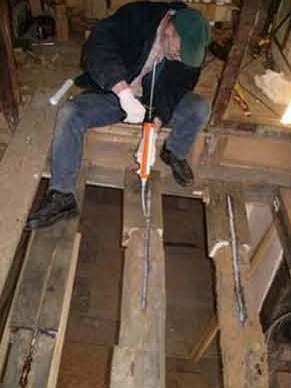 The first step in the repair was to support the floor joists from below using props. 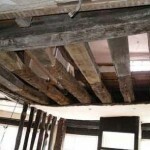 The damaged timber on each of the floor joists was then removed. 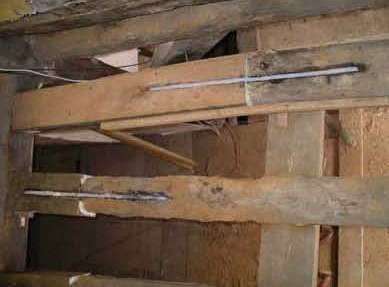 The length of damaged timber removed from each floor joist varied. 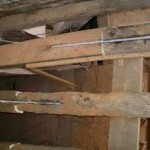 Each joist was slotted prior to having the end carefully removed. 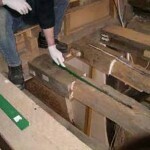 New joists were prepared in species matched oak with a similar moisture content. 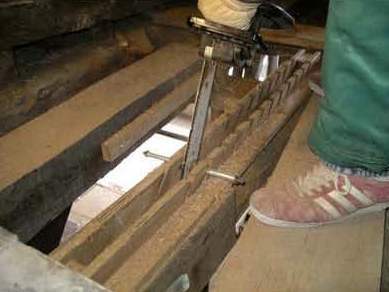 The slots in the existing were aligned to the new timber ends then cut using a chainsaw held in a Rotafix jig specially designed to control the position and depth of the slots. 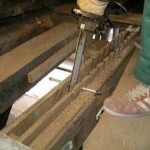 Once the slots had been cut and thoroughly cleaned RSA was injected through a tube into the bottom of the slots. The carbon fibre strip was then cut to length to match the length of the slot. 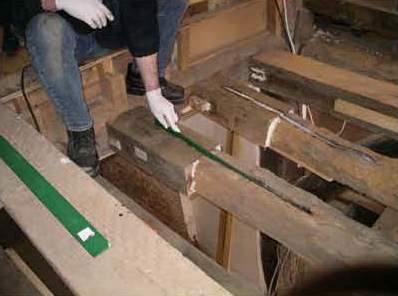 The pictures show the carbon fibre strip in its protective green coating which was removed prior to the installation into the slot. The protective coating keeps the surface grease free and clean. The carbon plate was inserted centrally into the prior injected RSA and then the slot was filled with a further layer of RSA as shown below. 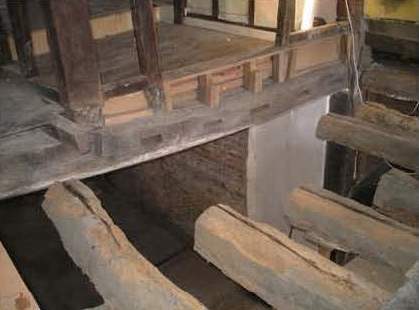 The props supporting the repair remained in place for 7 days. 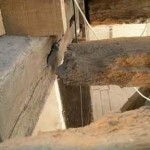 The new timber was contoured to match the distressed look of the original timbers. 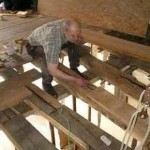 As the flooring covered the repair there was no cosmetic or aesthetic requirement to hide the adhesive. When there is an aesthetic requirement a thin slip of matching wood can be inserted to give a colour match and to cover the repair. 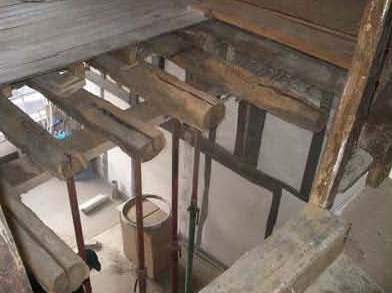 Rotafix are able to provide design support and provide all of the materials required to complete these types of historic restoration. 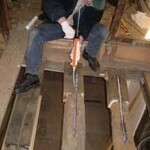 For further information about the Resiwood system of repair, using Rotafix Structural Adhesive or obtaining species matched replacement timber ends manufactured to meet your requirements, please contact us on +44 (0)1639 730481 where one of our technical team will be able and willing to assist.